This is the first year we are doing the Banner Exhibition & Competition which is open to public participation. We plan on displaying the banners annually along the Festival route, adding color and movement to the festive atmosphere. Both individuals and groups may submit entries. 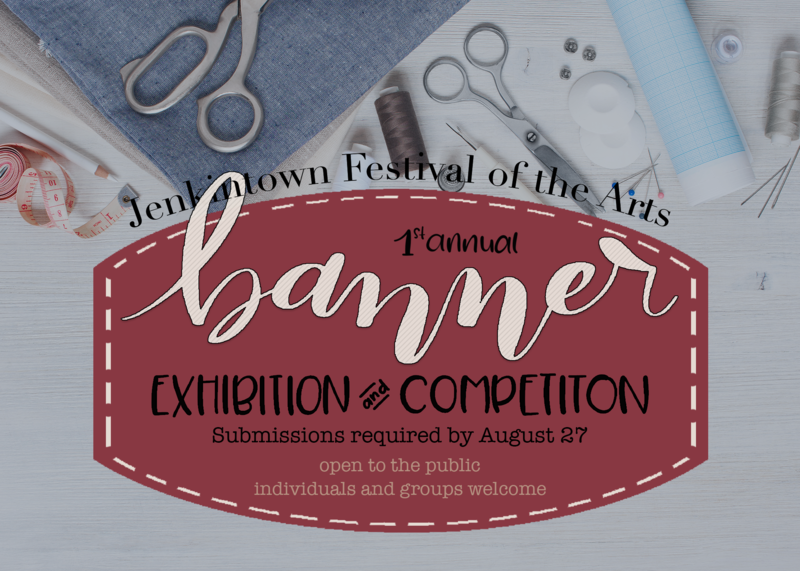 Create and submit a banner to hang above the Jenkintown Festival of the Arts. Enter your banner for the chance to win cash prizes of up to $200 in one of 3 different categories. The Banner Competition is brought to you by the Art of Framing and The Sewing Room. Banner entries are divided into three categories so that entrants are competing with their peers. Individuals or groups who work as fiber artists. Individuals or groups who are not working in the field of fiber arts. All individuals and groups under 18 years of age. We’re excited to announce our exclusive partnership with The Sewing Room! Our Friends from Jenkintown based The Sewing Room will be offering 2 banner making sewing classes on August 7th & 14th from 6:30 PM to 8:30 PM. Classes are $30.00 per session and include the use of sewing machines, threads and tools. BYOF – Bring Your Own Fabric! Banners will be accepted at The Art of Framing, until August 27th @ 5:30 p.m. Banners will be accepted at The Art of Framing, 413 Old York Rd, Jenkintown, PA 19046 until August 27th @ 5:30 p.m. Banners may be shipped or delivered by hand. Banners received after the deadline will not be considered. Submitted banners become the property of the Jenkintown Festival of the Arts. Should an artist request return of a banner, the banner will neither be juried nor hung at the Festival. When designing your banner, please remember that it will hang between 10 to 15 feet high along the street. The design must be visible from both sides of the banner (identical or different). All components of the banner design and construction must be securely attached, or the banner will not be displayed. Banners with religious, political, or commercial messages will not be accepted. Banners commemorating community organizations are permitted. The banner must measure 48” long and 24” wide. It must be able to be rolled up for storage purposes and may not exceed 10 pounds. Durable, strong, color‐fast, weather‐resistant materials. Approximately 4‐5 yards fabric, thread, dowels. Burlap or felt, various types of net fabric, loosely woven fabric such as casement goods, see ‐through plastics, water soluble glues, or fragile adornments. Please do not use glitter. The banner must be hung from a 36” poplar dowel, either 5/8” or 3/4” in diameter. Please do not use an oak dowel or a metal rod since it is difficult to secure the banner to those materials. The dowel will extend 3” on each side of the banner. The banner must be weighted at the bottom. The weight must be completely enclosed and should be heavier than the top dowel. We recommend a heavy metal chain which can be sewn into place at several locations. Please be sure the ends are also tacked in place. The weight on the bottom keeps the banner hanging vertically even in windy conditions. Lettering or printing on the banner should be easy to read, clear, simple and direct.